Adelaide may be known as the City of Churches, but it could very well be the City of Anglers given the huge number of amazing fishing spots. Whether you’re just trying out fishing for the first time, or you’re serious about the sport, South Australia offers some world class fishing opportunities in both fresh and salt water. Here are our favourite fishing spots near Adelaide. Load up the car and head about an hour north of Adelaide to Dublin’s Thompson Beach, and you’ll find some of the best coastal crabbing opportunities in Australia. Get in amongst the shallows and use a crabbing rake to gather up the blue swimmer crabs that teem in the area – but look closely, as they like to hide among the seaweed. As tempting as it may be to feel the sand beneath your feet, this is definitely a time to keep your shoes on if you don’t want to get nipped. A walk along the shallow with a rake and bucket is all you need to nab some crabs at Thompson Beach. You’ll find blue swimmer crabs throughout the area from October to April, but locals say the sweetest and tastiest crabs are caught between the beginning of October until mid November. If crabs aren’t your jam, Salmon Trout are found in the area too. There are some restrictions on the amount of crabs you can catch in the area, and the region is frequented by fisheries officers, so familiarise yourself with catch limits here before you head out. A fantastic spot for a family fishing day, Snowden’s Beach at Largs North along the Port Adelaide river has great fishing, as well as shady tree lined picnic spots. You’ll find bream, mulloway and salmon trout in the area and even if you don’t have any luck yourself, there are plenty of great seafood take aways nearby that will keep the whole family happy. With a beautiful sandy beach, the kids will love building sandcastles and playing while the grown ups try their luck casting a line. Mornings are best for bites, when the water is at low tide, but catches can be made at any time throughout the day for the angler with a bit of patience. Well worth the forty minute drive out of Adelaide, St Kilda is a great choice for those looking for land and boat fishing – as well as plenty to do in the area if the fish aren’t biting! With one of the best adventure playgrounds we’ve seen, the kids will be in their element, and the adults might want to get involved too! With a castle tower with super sized slides, a wooden fort, an enormous old wooden pirate ship to play on, this is one that will have the kids shouting “Are we there yet?”! Catch-wise, St Kilda offers up some awesome rock fishing – but you will want to set up early as the popularity of the area sees the rocks get quite crowded. From the rocks, you’ll find whiting and bream, and even the odd salmon trout. If you’re bringing the boat, St Kilda is an excellent place to launch and if you head out towards the channel, you’ll find plenty of yellowfin whiting, mullet, and even crabs. Popular with tourists from all over the world, and just a fifteen minute light rail ride from the city, Glenelg Jetty is great for hobby anglers looking for a great day out. Free of boats, Glenelg Jetty is a bit of an anomaly among local jetties, with not much to scare away the fishes. This is fantastic for finding garfish and squid loitering around the seaweed at the Jetty’s pylons. You’ll also find Tommy Ruff and plenty of bream in the area. The area round the jetty has plenty of picnic areas for a family day out, and some of the best fish and chip shops in Adelaide. So don’t worry if you don’t have too much luck yourself! Head about half an hour further north than Glenelg, and you’ll find yourself at North Haven. With calm waters making this a popular fishing and swimming area, North Haven has some of the best fishing in Northern Adelaide. The rocky breakwater creates a bottle neck from the gulf, funnelling fish into the area in search of a feed. Visiting North Haven in the early morning and late evening will yield the best results, and eager anglers can expect to hook salmon, pilchards and flathead. 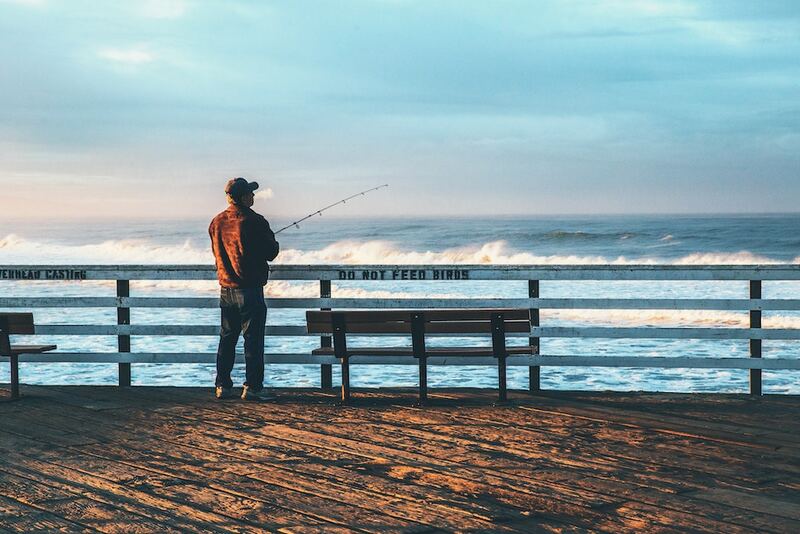 When you’ve retired your reels for the day, head up the beach to the North Haven Surf Life Saving Club for a top notch fisherman’s basket for dinner and relax looking out over the stunning views. And before you head out anywhere, make sure you save Marshall Batteries roadside assistance number in your phone. No matter how your day of fishing went, if you holler for a Marshall on 1300 627 742, we’ll bite!